Born to the Spanish nobility, the daughter of Don Alonso Sanchez de Cepeda and Doña Beatriz. She grew up reading the lives of the saints, and playing at "hermit" in the garden. Crippled by disease in her youth, which led to her being well educated at home, she was cured after prayer to Saint Joseph. Her mother died when Teresa was 12, and she prayed to Our Lady to be her replacement. Her father opposed her entry to religious life, so she left home without telling anyone, and entered a Carmelite house at 17. Seeing her conviction to her call, her father and family consented. 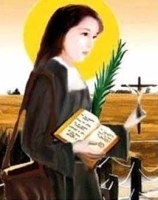 Her parents were martyred when Magdalena was about nine years old. 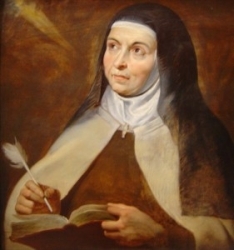 She became an Augustianian tertiary, and worked as an interpreter and catechist for Augustinian missionaries Father Francis of Jesus Terrero and Father Vincent of Saint Anthony Simoens. Martyr. Hermit in northern Mesopotamia. Bishop of Edessa, Syria in 361. For his firm defense of orthodox Christianity, he was exiled to Egypt by the Arian Emperor Valens in 373. Sent to the Phoenician island of Aruad, he brought most of the residents and clergy back to the orthodox faith, and was so successful that Valens had him exiled to farther and more isolated locations in Egypt. Benedictine nun at Wimborne Abbey, Dorset, England. 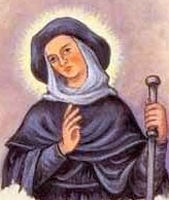 Missionary to Germany, working with her relative, Saint Lioba of Bischofsheim, and Saint Boniface. Abbess of Ochsenfürt Abbey and then Kitzingen Abbey. Born a princess, a member of the royal family of Hugh Capet. To escape marriage, she fled to Alsace and lived as a recluse for 52 years. Only Bishop Wolfgang of Ratisbon knew that she was even alive. Hermit on Mount Olympus c.848. Hermit on Mount Athos in Greece, and became a noted preacher in the area. Founded a monastery in Salonika where he lived for a while as a hermit. Founded a monastery on and another one near Mount Athos. Late in life, he retired to living as a prayerful hermit. Spiritual student of Saint Germanus of Auxerre and Saint Lupos of Troyes. Worked with Saint Germanus to oppose Pelagianism in the British Isles. Missionary to the Germans in the lower Moselle region. Bishop of Trier, Germany in 446. Benedictine monk at Gorze, Lorraine, France. Abbot of Stavelot-Malmedy, Belgium in 945. Made his monastery an example of discipline and a center of learning in the region. Nun at Nonnberg Abbey in Austria. Late in life she retired from community life to live as an anchoress. Friend of Saint Mercutialis. Martyred by Saracens. Hermit. Founded Vandoeuvre Abbey in France, and served as its first abbot. Bishop of Catania, Sicily. In later years he resigned to become a hermit. Fifth-century bishop of Marseilles, France. A group of 360 Christian soldiers martyred together in the persecutions of Diocletian and Maximian.